v. : ; 28-36 cm. Suspended between v. 35, no. 1 (fall 1999) and v. 36, no. 1 (spring 2005). Latest issue consulted: Vol. 36, no. 2 (fall 2005). 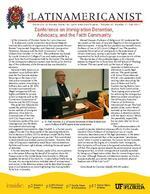 LATI NA MERICANIST t he University of Florida Center for Latin American Studies | Volume 42, Number 2 | Fall 2011 T he University of Floridas Center for Latin American Studies and Loyola Universitys Jesuit Social Research Institute led a coalition of organizations that sponsored the con ference Imprisoned, Forgotten, and Deported: Immigration Detention, Advocacy, and the Faith Community in New Orleans from October 13-14, 2011. The conference was hosted by Loyola Universitys College of Law and made possible by a grant from the Ford Foundation held by the Center. The realities of the immigration detention system were the focus for the first day of the conference, while the second day was devoted to advocacy. National Public Radio corre spondent Laura Sullivan deliv ered the first keynote address, lecturing on the topic of pri vate prison companies in the detention system. According to Sullivan, laws such as SB 1070, Arizonas controversial antiillegal immigration bill, are highly profitable for private prison companies such as the Corrections Corporation of America and the GEO Group. The panel that followed dis cussed the political and eco nomic realities of immigrant detention. Dora Schriro, Commissioner of the New York City Department of Corrections, spoke of her own investigations into the deten tion systems shortcomings and suggested improvements. Alger Kendall, Jr., a former county judge of Karnes City, Texas spoke of the reasoning behind his towns decision to allow GEO to develop a model facility there. He described GEO as a good county partner that contributed to local schools and funded community events. However, Bob Libal of Grassroots Leadership noted Texas remote detention facilities and human rights abuses, including the sexual assault of detainees. A former detainee, Omar Hassan, spoke of his own experienc es in the system following the denial of his asylum claim. Mr. Hassan came to the United States from Somalia in 1996 and appealed the denial of his claim for 13 years before finally losing his case. His moving testimony included tales of mistreatment and racism in the detention system, and he described his experi ence in civil detention as more frightening than having bullets fly by him in Somalia. Conference on Immigration Detention, Advocacy, and the Faith Community Directors Corner inside: p2 2012 Annual Conference p3 Faculty News & Publications p7 Alumni News & Notes p17 Manuel Vsquez, Professor of Religion at UF, moderated the next panel, on the topic of race and illegality in the immigration detention system. Among the four panelists was Kenneth Nunn, Professor of Law at UFs Levin College of Law. The panelists compared the situation of immigrants to the experiences of African Americans, noting in particular the higher rates of incarceration for both minority groups in comparison to whites. The second day of the conference began with a keynote address by Miguel De La Torre from the Iliff School of Theology in Denver. The next panel took up the topic of religious responses to detention as an alternative to purely legal reforms. The panel opened with Anton Flores-Masonet, M.S.W., who presented a brief, moving video recounting the story of Pedro and Emily Guzmn during Pedros incar ceration. Faith communities have tipping point potential for reforming the immigration detention system according to David Fraccaro, Executive Director of FaithAction International House. The final panelist, Sister JoAnn Persch, summed up her discussion of advocacy in detention centers with her teams motto: We do this peacefully, respectfully, but we never take no for an answer. The conference ended with a panel on secular detention advocacy efforts. Hiroko Kusuda, Assistant Clinic Professor of Immigration Law at Loyola University, described some of the legal parameters in the deten tion system and asserted that, in her experience, persistence works when it comes to advocacy. For activist Jacinta Gonzalez, until we remove the stigma of criminality from immigrants, their humanity will continue to be ignored and advocacy efforts will fail. This stigma persists despite the administrative nature of immigration law, in which immigrants are typically punished for being out of legal status rather than for committing an actu al crime. Although these are civil detention centers, as Hiroko Kusuda explained, you cannot take away someones physical freedom and still be truly civil. -Contributed by Courtney Sidwell, MALAS student Fr. Fred Kammer, S.J. of Loyola University of New Orleans and Laura Sullivan of NPR spoke at the conference. FALL 2011 5 T he Director of UFs Center for Latin American Studies, Philip Williams, and the Dean of the UF Graduate School, Henry Frierson, traveled to Tegucigalpa, Honduras in July 2011 to sign an agreement with the Secretariat for Indigenous and Afro-Honduran Peoples (SEDINAFROH). Established in November 2010, SEDINAFROH is the first ever cabinet-level ministry in Latin America responsible for the development of indigenous and afro-descendent communities. The new agreement will establish a graduate fellowship program to be administered by the Center for Latin American Studies and supported by the Government of Honduras. The program will provide fellowships for up to ten Ph.D. and ten Masters students whose research and training interests further the goals and purposes of SEDINAFROH. Williams and Frierson attended the signing ceremony for the agreement that took place at a cabinet meeting presided over by the President of Honduras, Porfirio Lobo Sosa. During the ceremony, President Lobo expressed his strong support for the initiative and the importance of providing graduate training opportunities to students at such a prestigious university. In his remarks, Williams emphasized how investing in education was the most important tool to ensure the countrys future development and progress. He also pointed to the agreement as a first step in a long-term relationship between UF and Honduras. During their visit, Williams and Frierson also met with officials at the Autonomous University of Honduras to discuss graduate programs at UF and opportunities for collaborative research. I n Her Name: Measuring the Gender Asset Gap in Ecuador, Ghana and India is a collaborative research study based at the Indian Institute of Management Bangalore (IIMB), which includes researchers from the University of Ghana, American University, Yale University, University of Florida and the Latin American Faculty of Social Sciences (FLACSO), Ecuador. This study examines the incidence of asset ownership of men and women separately within the same household to estimate the gender asset and wealth gaps. The Ecuador study, entitled Assets, Gender and Poverty in Ecuador, is a collaborative endeavor of the Gender & Culture Program at FLACSOEcuador and the UF Center for Latin American Studies. Carmen Diana Deere, Distinguished Professor of LAS and FRE, is the PI for the Ecuador project, and Jennifer Twyman, doctoral candidate in FRE, has been the principal research assistant. Funding for the project was provided by the Dutch Ministry of Foreign Affairs under its MDG3 Fund for Gender Equality. The study has included qualitative field work, a national household assets survey, and analysis and dissemination. Between August and December 2009, field work was carried out in three provinces of Ecuador: Pichincha and Azuay in the highlands, and Manab on the coast. These provinces were chosen to be illustrative of different processes of development as well as socio-economic characteristics, factors posited to influence the possibilities for asset accumulation. In each province field work was carried out in at least three municipalities, always including the provincial capital as well as several predominantly rural municipalities. The primary methodology was the focus group, complemented by interviews with key informants and a compilation of the secondary literature. All told, 40 focus groups were held, organized in collaboration with 23 organizations, ranging from womens and peasant organizations and cooperatives to microcredit groups. The qualitative field work was followed up by the planning and execution of a nationally representative household survey, called the FLACSO-UF 2010 Ecuador Household Assets Survey. The survey of 2,892 households was carried out between April and June, 2010, by the survey and public opinion consulting firm, HABITUS. Since then the team has been cleaning the data set and generating the descriptive statistics on the key variables. A book summarizing the key findings of the study was published in July 2010 and publicly disseminated. In addition, two popular education pieces were produced, one for use by womens groups, and another aimed at the training of those in the legal profession on womens property rights. The main finding of the Ecuador study was that women owned 52% of the gross physical household wealth, a share roughly equal to their share in the population. In contrast, in Ghana, women own only 31% and in Karnataka, India, only 19%. These differences are partly explained by the different marital and inheritance regimes of these countries; these regimes are obviously more favorable to women in Ecuador. Not withstanding these positive findings regarding overall gender equality in Ecuador, the distribution of wealth is extremely skewed, and female household heads are overrepresented among the asset poor. Focus on Research: Measuring the Gender Asset Gap in Ecuador Agreement with Government of Honduras to Establish Graduate Fellowships L uis Green, Secretary of State for SEDINAFROH; Porfirio Lobo Sosa, President of Honduras; Philip Williams, Center Director; and Henry Frierson, Dean of the UF Graduate School. 8 THE LATI NA MERICANIST FACULTY Faculty News and Publications continued (CIFE) at the Universidad de los Andes in Bogot in July, and a keynote address entitled Procesos de socializacin de los nuevos docentes en la cultura acadmica at the 10-year anniversary of CIFE, also in July. Juan-Carlos Molleda (Public Relations) was awarded the Public Relations Society of America (PRSA) Educators Academy Top Faculty Research Paper Award for Testing a Perceived Authenticity Index with Triangulation Research: The Case of Xcaret in Mexico (with R. Jain) at the PRSA International Conference in October. He delivered invited lectures on Las dimensiones de la autenticidad percibida at the Congreso Internacional de Comunicacin Estratgica en Medios Interactivos in October in Medelln, El profesionalismo y roles de los relacionistas pblicos en las organizaciones modernas desde una visin internacional, and Identidad, autenticidad y reputacin: La triada dinmica at the Colegio Profesional de Relacionistas Pblicos del Per in Arequipa in August. Publications: Crisis transnacional global en relaciones pblicas: el caso Chiquita Brands (with A.F. Giraldo, L.H. Botero, & V. Bravo). Palabra Clave 14(1) 2011: 31-52. Stephen Perz (Sociology and Criminology & Law), Rafael Muoz-Carpena (ABE), and Gregory Kiker (ABE) were awarded an NSF Coupled Natural and Human Systems (CNH) grant for $1.4 million over four years entitled Global Sensitivity & Uncertainty Analysis for Evaluation of Ecological Resilience: Theoretical Debates over Infrastructure Impacts on Livelihoods & Forest Change that takes up the case of the MAP frontier in the southwestern Amazon where Bolivia, Brazil and Peru meet. Stephen Perz (Sociology and Criminology & Law) will serve as Administrative Coordinator on a $6.5 million, 5-year cooperative agreement funded by USAID for its ICAA II (Initiative for Conservation of the Andes-Amazon, Phase II) program for the new Madre de Dios Consortium, led by UF, with the Madre de Dios Special Project, the National Amazonian University of Madre de Dios, Futuro Sostenible and Woods Hole Research Center as consortium partners. Publications: Regional Integration and Local Change: Road Paving, Community Connectivity and SocialEcological Resilience in a Tri-National Frontier, Southwestern Amazonia (with L. Cabrera, L. A. Carvalho, J. Castillo, R. Chacacanta, R. Cossio, Y.F. Solano, J. Hoelle, L.M. Perales, I. Puerta, D. R. Cspedes, I.R. Camacho, & A.C. Silva). Regional Environmental Change (Online First, 5/24/11); Connectivity and Resilience: A Multidimensional Analysis of Infrastructure Impacts in the Southwestern Amazon (with A. Shenkin, G. Barnes, L. Cabrera, J. Castillo, & L.A. Carvalho). Social Indicators Research (Online First, 2/8/11). Charles Perrone (SPS) presented Shared Passages: Spanish-American-Brazilian Links in Contemporary Poetry at the AATSP session of SAMLA in November, served as the artist liaison and lead consultant for Transcreation: The Word-Things of Augusto de Campos at the Elizabeth Foundation for the Arts in New York in November, and participated in the panel "Writing Rio de Janeiro" and launch at the Americas Society in New York in November. Publications: Capital Lyric: Poetry and Song in Contemporary Rio de Janeiro and Salvador, Bahia. Review: Literature and Arts of the Americas 44(2) 2011: 212-222; Brazilian Literature, Poetry. Handbook of Latin American Studies 66 2011; translations of Dorival Caymmi, Chico Buarque, and Vincius de Morais in Review: Literature and Arts of the Americas 44(22) 2011; and five poems in Ygdrasil: A Journal of the Poetic Arts 19:9, 2011. Stephen Powell (Law) Global Laws, Local Lives: Impact of the New Regionalism on Human Rights Compliance (with P.C. Prez). Buffalo Human Rights Law Review 17 2011: 117-153. Mary Risner (LAS) A Community of Practice of Business and Foreign Language Faculty. In M. Watson & C. Prez Llantada, eds. Specialized Languages and Globalization: A Multi-Perspective Approach Newcastle upon Tyne: Cambridge Scholars Publishing, 2011. Daniel Sokol (Law) presented three papers in Chile: "Cartels, Corporate Compliance and What Practitioners Really Think About Enforcement" at the Catholic University of Chile in July, "Cartel Remedies and the Case for Corporate Monitors" at the University of Chile in October, and "Prioritizing Cartel Enforcement in Small Economies" at the Fiscal Nacional de Economia's Dia de la Competencia in Santiago in September. Maya Stanfield-Mazzi (Art History) Cult, Countenance, and Community: Donor Portraits from the Colonial Andes. Religion and the Arts, 15(4) 2011: 429. Brijesh Thapa (Tourism, Recreation & Sport Management) presented the paper Satisfaction with Eco-Experience: A Case of Costa Ricas Ecolodges at the Global Sustainable Tourism Conference in South Africa in November. Publication: Environmental Management in the Caribbean Accommodations Sector (with M. Best). Tourism 59(2) 2011: 145-168. Hannah Covert stepped down as Executive Director of the Center at the end of December to relocate to New Orleans. Hannah worked tirelessly for the Center for over ten years, rst as Associate Director of the TCD program and then as Executive Director. She graduated from the MALAS program in 1998 and just received her PhD in Higher Education Administration from UF. We wish Hannah all the best in her future pursuits! FALL 2011 9 FACULTY Recent Faculty Books Carmen Diana Deere and Jackeline Contreras Daz Acumulacin de activos: una apuesta por la equidad FLACSO, Sede Ecuador, 2011 This book summarizes the key ndings of the research project Assets, Gender and Poverty in Ecuador, a collaborative endeavor of the Gender & Culture Program at FLACSOEcuador and the UF Center for Latin American Studies. Field work was carried out in municipalities in three provinces of Ecuador that illustrate a range of income-generating activities that might facilitate womens accumulation of assets. See page 5 for more details on the study. Benjamin Hebblethwaite Voudou Songs in Haitian Creole and English Temple University Press, 2011 Vodou songs constitute the living memory of Haitian Vodou communities, and song texts are key elements to understanding Haitian culture. Vodou songs form a profound religious and cultural heritage that traverses the past and refreshes the present. Offering a one-of-akind research tool on Vodou and its cultural roots in Haiti and pre-Haitian regions, Vodou Songs in Haitian Creole and English provides a substantial selection of hard to nd or unpublished sacred Vodou songs in a side-byside bilingual format. Marie Friedmann Marquardt, Timothy J. Steigenga, Philip J. Williams, and Manuel A. Vsquez Living Illegal: The Human Face of Unauthorized Immigration The New Press, 2011 Todays polarized debates over immigration revolve around a set of one-dimensional characters and unchallenged stereotypes. Yet the resulting policy prescriptions, not least of them Arizonas draconian new law SB 1070, are dangerously real and profoundly counterproductive. A major new antidote to this trend, Living Illegal is an ambitious new account of the least understood and most relevant aspects of the American immigrant experience today. Based on years of research into the lives of ordinary migrants, Living Illegal offers richly textured stories of real peopleworking, building families, and enriching their communities even as the political climate grows more hostile. T he UF Center for Latin American Studies invites applications for a tenure-track assistant or associate professor in the social sciences with a teaching and research focus on crime, law, and governance in Latin America to begin in August 2012. The appointment will be made jointly between the Center and the appropriate disciplinary department within the College of Liberal Arts and Sciences. Substantive interests may include but need not be restricted to: the causes and consequences of crime and crime victimization, transnational criminal activities, and comparative analysis of crime and violence in Latin America and the United States. Additional details are available at: http://jobs. ufl.edu, requisition #0809591. Faculty Search: Crime, Law, and Governance in Latin America Library Travel Grants T he Center for Latin American Studies, with support from its U.S. Department of Education National Resource Center grant, made ten travel awards for research at the UF libraries in summer 2011. Scholars from the following universities visited the Latin American Collection: LaGuardia Community College, Saint Leo University, Ohio University, Jacksonville University, Vanderbilt University, University of Central Florida, Southern Illinois University: Edwardsville, Washington University, Denison University, and East Carolina University. The scholars represented a variety of disciplines, including anthropology, history, languages, Latin American Studies, philosophy, and sociology. Information on the 2012 Library Travel Grants program is available at: http://www.latam.ufl.edu/Funding/travel.stm. FALL 2011 11 OUTREACH T he Centers Outreach Program held its first summer teacher institute focusing on the sciences in July 2011. The Latin American Ecosystems Institute emphasized the use of emerging technologies and local resources to address state science standards and continued the Centers efforts to integrate Latin American content beyond the K-12 social studies and foreign language curriculum. Fifteen teachers attended the three-day institute, twelve local elementary and middle school teachers and three elementary teachers from Brevard County. The program was filled with hands-on activities, site visits, and presentations connecting the broad theme of ecosystems in the Latin American context. UF speaker presentations ranged from plants and insects, climate change literacy, conservation and sustainability issues in indigenous communities, and the use of social media for educational purposes. Local second grade Williams Elementary School teacher, Sandra Davis, discussed strategies to integrate a rainforest unit into the curriculum of a Gifted Magnet Academy Program. Partnerships with the TCD program, the LUBEE Foundation, and the Florida Museum of Natural History (FLMNH) highlighted the local resources available to Florida teachers; such as UF faculty and graduate students, the FLMNH Butterfly Garden and Dugout Canoe Exhibit, and the LUBEE Bat Conservancy. The Institute gave teachers the opportunity to learn from people who work on Latin American ecosystems and exposed them to local resources where they can take kids to enrich classroom activities said Patricia Sampaio, TCD Program Coordinator and a member of the institutes planning committee. Resources from the teacher institute will enhance K-12 students visits to FLMNH, which are funded by the Centers Title VI NRC grant. Other outcomes include the creation of a science traveling suitcase and expansion of visits of UF faculty and graduate students to K-12 science classes. For more information about the institute, please visit our wiki at http:// latinamericanecosystems.wikispaces.com/. To volunteer to present about science in a local K-12 class, please e-mail us at: outreach@latam.ufl.edu. Ecosystems of Latin America Summer Teacher Institute: Connecting Science and Area Studies Introduction to Latin American Ecosystems, Emilio Bruna, UF LAS/WEC Integrating a Rainforest Unit into the Curriculum of a Gifted Magnet Academy Program, Sandra Davis, Williams Elementary School Gifted Magnet Program The Changing Climate and the Need for Climate Literacy, Christine Archer Engels, UF Family, Youth, and Community Sciences A Story of Traditional Hunters: Jaguars and Oil Exploitation in Ecuador's Amazon, Santiago Espinosa, UF WEC People and Ecosystems, Rosana Resende, UF Anthropology -Contributed by Korey Force, MALAS student Latin American Ecosystems Presentations Participants of the Ecosystems of Latin American Teacher Institute. 12 THE LATI NA MERICANIST Student NEWS STUDENTS Student Field Research Grants: People on the Move The Center and TCD awarded 24 grants totaling $43910 in the 2011 field research grant competition. The grants, typically ranging from $1500 to $2000 each, allowed UF graduate students to conduct field research in 10 Latin American countries as well as in Ghana and the Philippines. (The TCD Program funds research in tropical areas outside of Latin America.) Topics ranged from sea turtles in Brazil, to ancient sharks in Panama, to coffee in Jamaica. One of the common themes among several of the researchers was people on the move either physically from one place to another, psychologically and culturally in the search or struggle for identity, or politically and socially through participation in social movements and NGOs. Alissa Jordan (Anthropology) traveled to Barbancourt, Haiti to conduct ethnographic research among earthquake survivors at Camp Mahanaim, only to learn that most of the former inhabitants had recently returned to Port-au-Prince. Still, she was able to explore conflicts between camp dwellers and town residents and religious tensions and to refine questions for future research. Krystal Anderson (MALAS) interviewed some 30 Ecuadorians regarding the perceived costs and benefits associated with migration/return migration, in order to determine the impact of Ecuadorian government efforts to encourage Ecuadorians to return home. Jamie Lee Marks (Anthropology) focused on rural to urban migration among Andean women in Peru. She worked with the NGO La Casa de Panchita, conducted interviews, and traveled to the highlands community Huanuco. Eshe Lewis (MALAS) also traveled to Lima to study two AfroPeruvian organizations: CEDET, founded in the 1990s and comprised of veteran activists, and Makingu, a younger spin-off group of Afro-Peruvian youth between the ages of 20 and 33. She discerned intergenerational conflicts, complementary and competing agendas, and a lack of communication between the groups. Camee Maddox (Anthropology) explored feminist activism and cultural politics in Martinique. She interviewed participants in the 2009 general strike, and met and interacted with leaders of Caribbean migrant communities. She spent her evenings as a participant observer among artists, musicians and bl dancers. Corey David de Sousa (Anthropology) dealt with movement of a similar kind, participating in several samba classes and schools in Rio de Janeiro, exploring the role of place, cultural identity, selfimage, work, and culture. Carlos Iiguez (MALAS) looked into the questions raised by the prominence of elite Afro-Ecuadorian soccer players, namely the social contradictions of race, class, and identity. Finally, Erin Zavitz (History) ventured to Haiti to locate archival sources, make contacts for oral histories, and conduct preliminary interviews related to her research on how Haitians have commemorated one of the western worlds most consequential historical movements, the Haitian Revolution. -Contributed by Richmond Brown, Associate Director Left: A soccer field in El Juncal in the Chota Valley where many of Ecuador's greatest players from the last 20 years got their start playing barefoot and with no ball. Right: Carlos Iiguez (MALAS) with Rodrigo Paz, the principal director of Liga Deportiva Universitaria de Quito, a club team. FALL 2011 13 STUDENTS GRADUATES New MALAS Students Toms Castellanos (Cornell University) History Emily Castillo (Eckerd College) Development Studies Jessica Franey (Samford University) Development Studies Korey Force (Saginaw Valley State University) Development Studies Alyssa Peavey (University of North Carolina at Chapel Hill) Development Studies Courtney Sidwell (Centre College) Latino Studies Ana Szogi (Baylor University) Development Studies James Taylor (Jacksonville University) Religion and Society Mara Tobn (Pontificia Universidad Javeriana Cali) Development Studies Weslley Albuquerque (Political Science) Ana Ansola (Business Management) Pamela Battistini (History and Anthropology) Natalia Cardona (Anthropology) Pablo Crucet (History) Sara Edelman (Environmental Science) Maritza Gaviria (Economics) Nilo Rodrigo Farfn Aramayo (Economics) Rachel Hunt (Anthropology) Rachel Lowery (Psychology and Criminology) Diana Moreno (Political Science) Stephanie Ramirez (Public Relations) Macarena Santos (Anthropology) Lara Schmertmann (Political Science and Portuguese) Catalina Vargas Villalobos (Political Science) Vanessa Bravo (Mass Communication) Timoteo Mesh (Interdisciplinary Ecology) Interdisciplinary Studies Major in Latin American Studies Undergraduate LAS Minors & Certificates Graduate LAS Certificates MALAS Degrees Jessica Neer Paul Deis (Political Science) Advisor: Philip Williams Thesis: An Examination of the Rule of Law Improvements of Plan Colombia and President Alvaro Uribe, 2002-2010 Brian Readout (Development Studies) Advisor: Carmen Diana Deere Thesis: Balancing Outreach and Sustainability: The Double Bottom Line of Microfinance in Ecuador First-year MALAS students. 16 THE LATI NA MERICANIST ALUMNI Marcos Avelln (BA Political Science 1995, MALAS 1998) works as a Store General Manager for Sears, Roebuck and Co. in the Miami market after three years in Tampa Bay. He recruits at all levels for the organiza tion, including recent college graduates and seasoned professionals. April (Bright) Baer (MALAS 1995) is a Business Development Manager for Poole & Associates. She lives in Maryland. Larissa R. Baia (MALAS 1996, PhD Political Science 2004) is the Associate Vice President of Enrollment Management at Manchester Community College in New Hampshire. Gregory Bates (MALAS/JD 2007) works as Compliance Counsel for Latin America at Avon Products in New York, NY. Christina Bennett (BA Anthropology & LAS Minor 2010) is pursuing a Bachelor of Science in Nursing at the University of South Florida in Tampa. She is also a member of the USF Florida/Caribbean AIDS Education and Training team. Antoni Castells-Talens (PhD Mass Communication 2004) works as a researcher at Universidad Veracruzana's Centro de Estudios de la Cultura y la Comunicacin, in Xalapa, Veracruz, Mexico. Donald E. DOrto, Jr. (MALAS 2001) is a middle school social studies teacher for Volusia County Public Schools in Florida. Celina Fernndez (MALAS 1997) is the Coordinator of a Culture of Lawfulness at the Consejo Cvico de Instituciones de Nuevo Len in Monterrey, Mexico. Andrea Ferreira (BA History 2004, MALAS 2009) is pursuing a PhD in Latin American History at UF, with a focus on 20th century racial constructs in Brazil and Cuba, under the guidance of Jeffrey Needell and Lillian Guerra. Kyle George (MALAS 1996) served in the US Army, including tours in Chile, Spain, Kuwait and Iraq. After graduating from Mercer University School of Law in 2009, he worked as the District Director for Congressman Jim Marshall. Kyle is now the Chief Deputy Clerk at the US Bankruptcy Court in Macon, GA. Valerio Gomes (MALAS 2001, PhD Geography 2009) works as the coordinator of Vale Foundation for the Nature Conservancy in Belm, Brazil. The program focuses on conservation efforts in the Brazilian Amazon. Norrie Horak (MALAS 1996) worked as a teacher after completing a Masters degree in Elementary Education. Norrie now owns Playball, a sports company catering to pre schoolers, and lives in Smyrna, GA. Augustn Iriarte Walton (MALAS 1988) is General Manager of Flora y Fauna Chile, an environmental consulting firm based in Santiago, Chile. Ed Johnson (MALAS 2006, MBA 2006) works as a Senior Manager at Deloitte Consulting, primarily focusing on Latin America. He lives in New York, NY. Tess Kulstad (MALAS 2006) is pursuing a PhD in Anthropology at UF. Ana S. Q. Liberato (MALAS 2001, PhD Sociology 2005) works as Assistant Professor of Sociology at the University of Kentucky. Steven Minegar (BA Political Science/ History 2008, MALAS 2010) is pursuing a PhD in Political Science at Emory University in Atlanta. Donathon Olliff (PhD History 1974) is retired from Auburn University where he taught for 30 years. He currently lives in High Springs, FL. Wendy Pond (MALAS 2006) is an International Programs Specialist for the US Office of Government Ethics in Washington, DC. Mary Risner (MALAS 2001) is the Associate Director for Outreach and the Latin American Business Environment Program at the UF Center for Latin American Studies. She just received her EdD in Educational Technology from UF. Nicolas Rubio (MALAS 2006) is an International Economist for the Foreign Agricultural Service branch of the USDA. Jacob Schultz (MALAS 2007) works as a Foreign Service Officer for the US Department of State. Elizabeth Smith (MALAS 2008) works as a banker for Wells Fargo in Sarasota, FL. She works primarily with Spanish and Portuguese-speaking clients as well as with local Latino businesses and volunteers as an ESL and financial education instructor. Amanda Stronza (MALAS 1995, PhD Anthropology 2000) is an Associate Professor of Recreation, Park and Tourism Sciences at Texas A&M University. Michele Thompson (MALAS 1996) works as a Criminal Investigator for the Office of the Inspector General of the Social Security Administration in the Chicago area. Josiah Townsend (MALAS 2006) graduated with a PhD in Wildlife Ecology and Conservation from UF. He specializes in the evolution, systematics, and conservation of Mesoamerican amphibians and reptiles. Cassandra White (MALAS 1993) was a Fulbright Scholar at Tulane University, receiving her PhD in Anthropology in 2001. She is currently an Associate Professor at Georgia State University in Atlanta. Cassandra is the author of An Uncertain Cure: Living with Leprosy in Brazil and lives in Clarkston, GA with her husband and daughter. & NEWS NOTES ALUMNI The number of UF MALAS graduates recently surpassed 500! 512 students have graduated from the program since its inception in 1954. FALL 2011 17 MALAS student Lindsay Barnes Arrieta and her husband Yeison Arrieta Badilla. Mary Risner, Aimee Green, and Hannah Covert; members of the Centers administrative dream team. Guests enjoyed dancing to Gilberto de Paz and the Tropix. Annual LAS Reception The UF Presidents House was a lovely venue for the reception. ADRIAN ZEH ADRIAN ZEH ADRIAN ZEH ADRIAN ZEH A good time was had by all at the Centers Annual Reception at the UF Presidents House! The event was once again co-sponsored by the UF Association of Hispanic Alumni (AHA).